Experience the beauty and elegance of a bye gone age at the charming 4 star approved country mansion, originally built as a castle, in 1627 and converted to a dwelling in 1748. Set in its own mature woodlands, with private access to the tranquil River Brosna overlooking a peaceful country village, right in the heart of Ireland. Just 80 kilometres from Dublin and Galway, adjacent to the N6 motorway. A mini gym is provided for the use of guests. This property has every conceivable comfort for the holiday maker and has the added facility of a Jacuzzi for the exclusive use of its valued guests. A children’s playroom is provided and an attractive library is available for the use of guests. A tennis Court is provided for the exclusive use of the guests, tennis raquets are supplied for your convenience The avenue and grounds are tarmac to provide comfort for guests. Golf outings can be pre arranged for guests. We had so much fun at this stunning country mansion at the kick off of our trip. It comfortably fit all 13 of us, and was a true experience in the gorgeous Irish countryside. Just an hour and a half (on the train located just 3 miles away) from both Galway and Dublin, it was a perfect location for us to see as much as possible during our 3 nights at Ballycumber house. All of us agreed that Connie was the best part of the whole experience. She was knowledgeable and helpful, and extremely passionate about the former castle turned home that has been in her family for generations. She even made sure we had reached our next destination safely. If you keep in mind that this is a unique experience and not a 5 star hotel (plumbing and electric were added well after the construction of the house) then you will not be disappointed! I would definitely send anyone headed to Ireland to stay in Connie’s beautiful home. Words are barely adequate to describe my “house party” at Ballycumber House. To celebrate a big “0” birthday, I decided to rent a big house and invite my friends and family to join me. Over the course of 3 weeks, 20 people came and went, and the house handled us all, even the night we had 15 for dinner! Connie is an absolute delight, and I am so glad I got a chance to know her. She is incredibly responsive, and her gracious warm welcome set the tone for our stay. The house became our home, and the perfect base for day trips all over the country. I was surprised at how much there was to see and do just within a short drive, and we loved exploring the Clara Bog. I hired a private chef, and when we returned from our excursions, there was coffee, tea and some little tasty treat waiting for us, along with the turf fire. Chef Chris prepared remarkable food in the small kitchen, and no one had to argue about who was going to shop, cook, and clean up after. 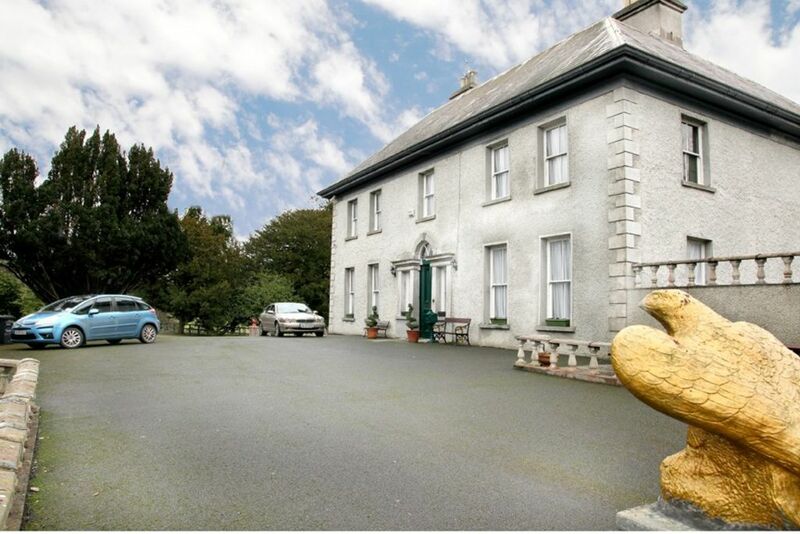 If you are looking for a centrally-located house, you can’t do better than Ballycumber House. It never felt too small, but when our numbers dwindled, it never felt too large either. The donkeys and the ponies grazing in the front pasture were delightful, too. The house (built as a castle in 1627) overlooks a 5,000-year-old ford and trade route, and is the starting point for a pilgrim walk to Clonmacnoise. How fun is that! Stay here. You will not be disappointed. The house suited our needs and had everything we required, even a little play room for my daughter! The location was perfect as we were able to travel to different places in Ireland. The local shop/pub/coffee shop was lovely and the people were very welcoming and as it was in walking distance from the house it was the perfect place to stock up. Thank you so much Rebecca, l am delighted you enjoyed your stay at Ballycumber House. We were a group of 10 adults plus a 10 month old traveling around Ireland, some of us for the first time and others, like me, traveling the Emerald Isle for the 4th time. I wanted a place centralized for part of our trip and Ballycumber was the best choice I could've made! Connie was wonderful from the very start and really showed she cared about her guests. This house is so amazing and the grounds are beautiful. The location is perfect, easy to find and super close to 2 great pubs! Gav and James were just as wonderful as Connie in making us all feel welcome! We came during a rather cold couple of days, it even snowed a bit! But we still loved the old feel of this house and really appreciated the fireplace in the main living room. Connie welcomed us early on our arrival day since our intercontinental flight got in at 5 am. Showed us around and gave us the history of the house. Just an absolutely amazing experience! Tons of room for all of us. Would love to stay again someday! Thank you so much Connie!!! We stayed at Ballycumber House in June/July. It is an easy 70 minute drive from Dublin, mostly on the M4/M6. First, the house is enormous, larger than you might think from the description. Our family of seven occupied only a few of the bedrooms. It is very homey and comfortable, with nice, firm beds, good heating (LOL-irish summers), and large bathrooms. We spent many hours hanging out in (one of the!) living rooms by the peat fireplace, enjoyed cooking in the modern kitchen, playing pool in the games room, or tennis. There is a lovely rock garden, picnic table, and nice walk by the river at the foot of the garden. A five minute walk down the drive brings you to the village, two nearby pubs (limited food but great beer selection), and grocery (Gussies has everything you could need). We drove to Tara and Newgrange, to Galway and Cliffs of Moher, and to Dublin, in an hour, so day trips are easy. There are many whisky distilleries (Tullymore Dew! ), monuments (Clonmacnoise is lovely), and small towns in a five to ten mile drive. What we loved: the roominess and just sheer loveliness of the house (have a Downton Abby fantasy-this will give you some idea of what it was like to live in a period house), the location (nice village and people, close to tourist areas for day trips), and of course Connie, who gives you a full introduction to the house and makes sure you are comfortable. She is a great host. Ballycumber House is an old home, so you will need to adjust to turning on heaters one hours in advance for the bath water, taking a bath (no showers), sometimes being chilly on a damp night (turn on the radiators-they work well). If you prefer city life, this is a country home. We genuinely loved the Irish countryside, the privacy, and the comfort of Ballycumber. We WILL be back to stay again. Thank you so much for the positive feed back, delighted you enjoyed your stay, and we look forward to having you as our guests in the future. You will enjoy your stay. The listing is accurate, and the property is clean and maintained. We had a problem with the clothes dryer during our stay and it was replaced by the end of the day. Our owner, Connie was a delight, I simply can not say enough positive things! I would highly recommend the property for a large group. We had 9 in our group and we had plenty of space and beds. We loved the rural setting, the animals, and the history. Do not miss having Irish Coffee from the Pub in town. James makes the best! Because of the age of the property, do not expect the most modern of accommodations. We had no issues, and found it part of the charm. We Americans had to learn how to bathe and not shower. But, we had fun learning! Miss Ireland immensely, and wonderful friends we made. Other Activities: pony treaking , nature study.